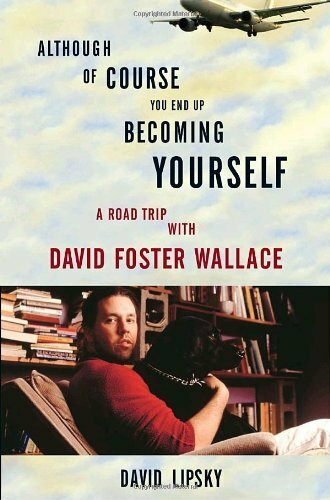 Perhaps the high point of Although Of Course You End Up Becoming Yourself, David Lipsky’s book-length interview with author David Foster Wallace (quoted here, here and here), finds Wallace coming clean about how the G-O-D question relates to his work. Once again, addiction serves as his preferred point of access to the subject of personal happiness/emptiness and, therefore, religion. It’s worth noting how this line of thinking, recorded in 1996 in reference to the then-brand new Infinite Jest, would find full expression later nine years later in his commencement address at Kenyon College. “The only thing that I knew for sure, I wanted to do something that wasn’t just high comedy, I wanted to do something that was very, very much about America. And the things that ended up for me being most distinctively American right now, around the millennium, had to do with both entertainment and about some kind of weird addictive, um… wanting to give yourself away to something. That I ended up thinking was kind of a distorted religious impulse. And a lot of the AA stuff in the book was mostly an excuse, was to try to have – it’s very hard to talk about people’s relationship with any kind of God, in any book later than like Dostoyevsky. I mean the culture, it’s all wrong for it now. You know? No, no. Plausibly realistic characters don’t sit around talking about this stuff. You know? So… I don’t know. But the minute I start talking about it, it just, it sounds number one: very vague. Two: really reductive. And the whole thing to me was so complicated, that you know it took sixteen hundred pages of sort of weird oblique stuff to even start to talk about it. And I feel stupid, talking about it. Extemporaneously. I feel stupid talking about it this way. Because it’s like, because I don’t have a diagnosis. I don’t have a system of prescriptions. I don’t have four things that I think are wrong. I don’t have four different… opinions about it. It seems to me that it’s more of a feeling, a sort of texture of feeling. Question for discussion: Where does one's Faith fit into this "information age"? I am heading for the river to spend time with my family in reality, not virtual reality. Perhaps DFW was writing about "Zeitgeist". Zeitgeist is "the spirit of the times" or "the spirit of the age." Zeitgeist is the general cultural, intellectual, ethical, spiritual, and/or political climate within a nation or even specific groups, along with the general ambience, morals, sociocultural direction or mood of an era (similar to the English word mainstream or trend). The term zeitgeist is from German Zeit- 'time' (cognate with English tide and "time") and Geist- 'spirit' (cognate with English ghost).